Around the Table Book: Your Table: An Attractive "Meal Zone"
Sandy got the chicken in the oven and had the vegetables cut up and ready to steam. She washed up the dishes she'd used so far and wiped down the counter. She opened a cupboard and pulled out four plates and got four forks and knives out of the silverware drawer. Then she turned around and looked at the kitchen table and let out a deep sigh. Cookie crumbs, an empty milk glass, and a paper towel "placemat" from her son's after school snack were at one end. Next to that his school books sat in a pile and a few papers had spilled onto the floor. Her daughter's computer was set up at the other end with papers and pens strewn around it. An iPod also decorated the table with its earphones dangling off the edge. The day's mail was in an unopened pile. Hair bands, a key, a deck of cards, and a magazine opened to the article she'd been reading at lunch were the finishing touches. Now Sandy had a decision to make: should she clear off the table and set it for dinner or could they just eat standing around the kitchen as had so often happened recently. 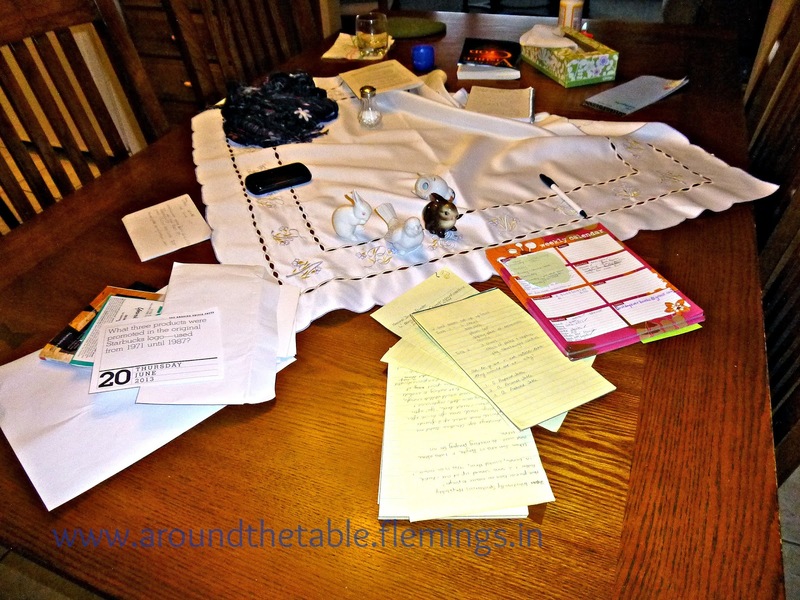 If she opted for clearing the table, what should she do with all the stuff cluttering it? I well remember those days when the kids came home, had a snack, and left everything sitting on the table. Our table was in a great spot for a "catch-all" --anything I wanted to take down to the bedrooms or up to the loft of our tiny town house in Bogota got set there, as well as what the kids might set down on their way between the living room and kitchen to get a snack. Even though they had desks, they often used the table for school projects which left scissors, glue and scraps of paper on it. Keep your table a clutter-free zone as much as possible. One idea is to take all that clutter and place it in a basket. At dinner bring the objects out one at a time and ask, "Whose is this?" No fair putting your own away beforehand! Make it light and fun. Maybe keep score as to who has the most, least, biggest, most valuable, etc. But ask them to put their stuff away after they've used the table so it can be ready for dinner. To help, keep a pretty basket near the table for those things you want to eventually carry to another part of the house rather than "storing" them on the table. Discipline yourself to use the table. 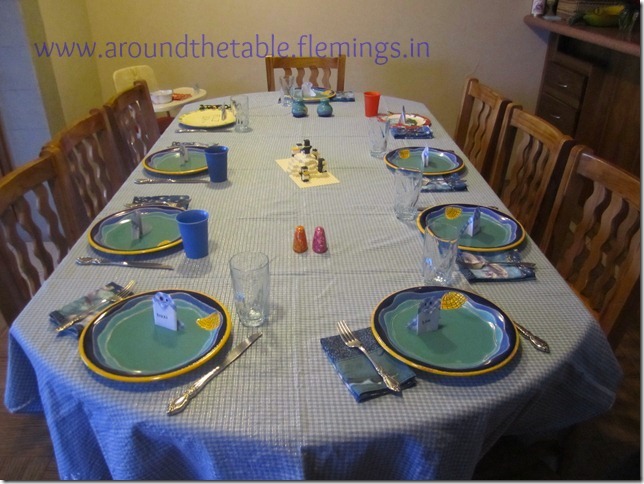 If you want your table to become a "meal zone" you will have to work to retrain your family. The more often you sit down together to eat, the more they will get to enjoy it. Standing around the kitchen or sitting around the family room invites people to leave quickly. Sitting at a table encourages them to linger longer. Use placemats or a simple tablecloth. 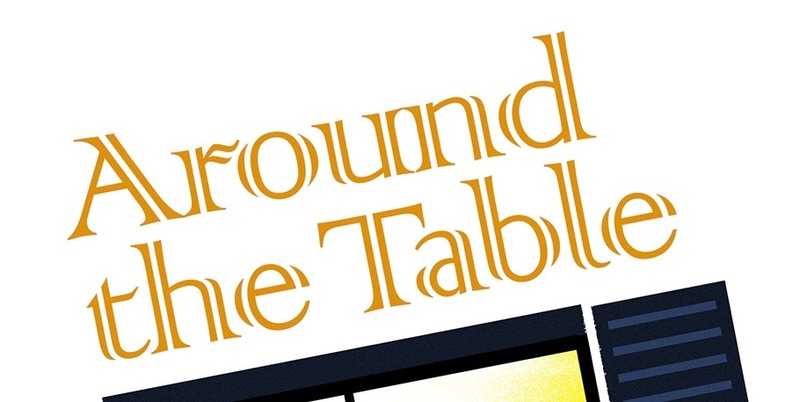 When our kids were little most of our placemats were vinyl. The kids each had their own favorite--Thomas the Train Engine, the Little Mermaid, Winnie the Pooh--and we had photo placemats of places we had visited, too. Click here for a tutorial on making your own personalized placemats. 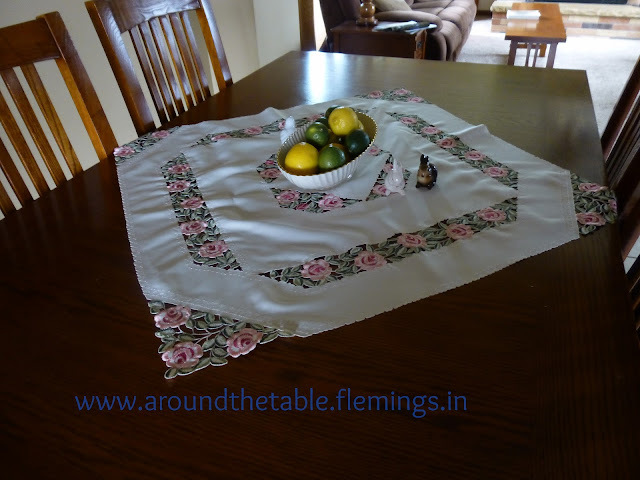 Now we use cloth, but a tablecloth still usually only lasts one meal, while placemats seem to do better. Add candles frequently. Their glow adds to the warm welcome. Play soft ambient music that won't interrupt the conversation or annoy anyone. Be as consistent as possible with the time. If everyone knows dinner is at 6, they can plan their day better. Though I still get many pleading they "didn't know" what time it would be or asking for a time change. Prepare a meal that is pleasing to the senses. Remember to make it look and smell appetizing as well as tasty to bring them running. I believe that if you work to keep your table a "meal zone" and make mealtime pleasing to all, you will find that your table attracts your family together. 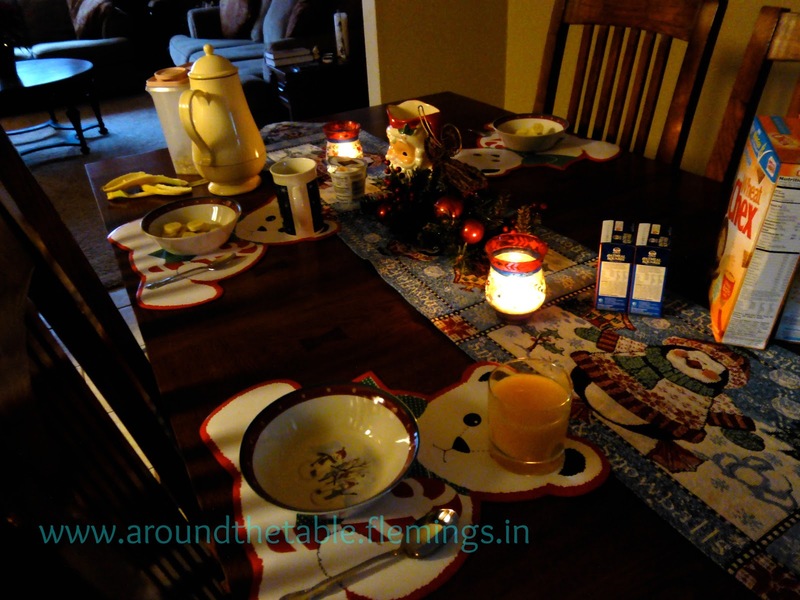 To read more on this check out this post, Looks Inviting, and this one, What's On Your Table? Love this article and I say, Amen! 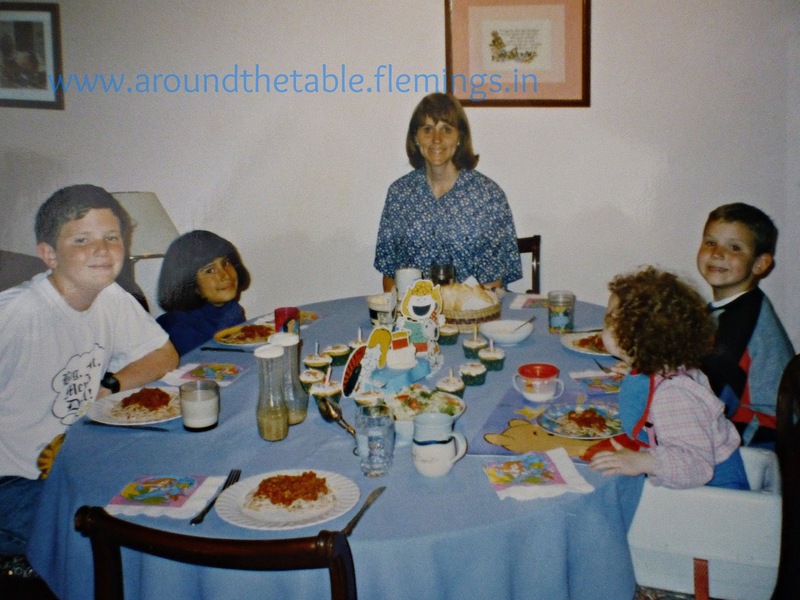 Gathering around the table was important to us. The girls shared stories about their day and it was a highlight of our day to gather together. 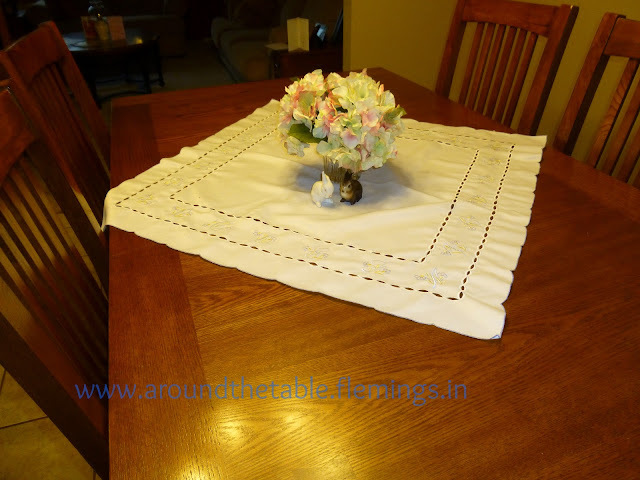 I love the linen and crocheted table square. Beautiful! I love table clothes and a bouquet of flowers on the table. They really do brighten the room. Just stopping by from the GRAND Social Linky Party. Hope you get a chance to do the same! I love the ideas of adding candles! As a family of three we don't use the table as often as I'd like but we are getting better! Pretty table settings! :) Visiting from Grandmas Briefs...have a nice 4th of July! I love your idea of keeping the table pretty and appealing. For days when we do have to use the kitchen table for school, I like to keep a laundry basket or crate handy. We put our work away so we can use the table and take a break from that particular project even though we may not want to.